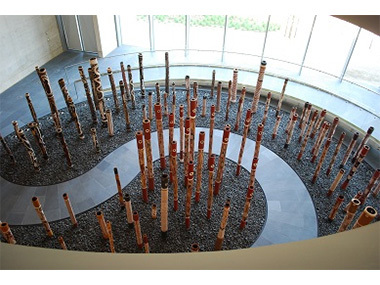 The 30th anniversary of the 1988 creation of The Aboriginal Memorial of 200 dupun/hollow log bone coffins by 43 artists from Ramingining is being celebrated this weekend with a lecture, conversations, a film and a symposium at the National Gallery (NGA) in Canberra. As the only artwork in the NGA's collection that is an immutable presence in the Gallery, there's no doubt of its importance in that institution's eyes. But is it actually in the right place? Should it be the reminder at the Australian War Memorial that 200 years of uncounted Aboriginal deaths commemorated by those dupun should be seen as just as significant as the losses by Australians – both Black and white – in foreign wars? Or should it be in the new Parliament House – to which it was first offered in 1988, though Michael Nelson Jagamara's mosaic was considered to be enough Indigenous content? It might have been a constant reminder to our self-centred Parliamentarians of the unresolved condition of Aboriginal Australia. For, sadly, Michael Nelson doesn't seem to have felt that his artwork was working. In 1993, he wanted “to take my painting back to my people” because “the Government of Australia has not recognised our people and our culture; it's abusing my painting and insulting my people”. And he removed a central motif. How did The Aboriginal Memorial come about? As a celebration, 1988 was of course anathema for many Aborigines...200 years of annihilation and assimilation. But the Yolngu artists of Ramingining needed to make art to feed themselves, so boycotting proceedings was unviable in the eyes of Djon Mundine, long-time art coordinator in the community. “Absence wouldn't have cut it”, he told me; “people would just say we went walkabout”. A local museum project was equally out of sight. But expat journo John Pilger had made a film raising questions about the absence of an Aboriginal war memorial, and somehow it found it's way to Ramingining, and seemed like a Good Idea. Negotiations for funding such a major project began with the the Australian War Memorial, which dismissed the idea out of hand. So to the wonderful Nick Waterlow directing the 1988 Biennale of Sydney, who signed on immediately. His enthusiasm drew in the Australia Council's Aboriginal Arts Board; followed by James Mollison at the NGA who was looking for “inspirational Australian art to match the drawing power of Blue Poles”. As people walk through the Aboriginal Poles today, following the track of the Glyde River as it mutates from fresh to the salt waters of the Arafura Sea – a meeting point that always has enormous significance for coastal peoples – do they realise the multiple levels of meaning on offer to them? For instance, as with the barks in the National Maritime Museum which won sea rights for the Yolngu, the symbols on the dupun represent each painter's clan and its position on that important journey. Then, there's the hurdle of making the cross-over from anthropology to art - for bone coffins, by their very nature are hard to remove from their anthropological context to become artworks that are marketable. Djon Mundine recognised “a tour de force was needed” to achieve such an effect. And, as Mundine explained in a recent Artlink essay, “Originally living trees, the installation is like a forest – an Aboriginal artistic vision of the forest and landscape. In the original ceremony each pole would contain the bones of deceased people, embodying the soul. Each tree in this new forest would (symbolically) contain the spirit of a deceased person. The forest as the environment is us, we are the environment. Each dupun or Hollow Log is ceremonially a Bone Coffin so the forest represents a large cemetery of dead Aboriginal people – a war cemetery and a war memorial to all those Aboriginals who died defending their country. Two hundred poles were commissioned to represent the two hundred years of white contact and black agony”. Meanwhile, Aussie art historian, Terry Smith went to town in a US academic journal – hailing the Memorial as a prime example of critical theorist Homi Bhabha's “post-colonial contra-modernity...in contention with and resistant to modernity's assimilationist technology, but also deploying cultural hybridity to inscribe it”. Smith continued, “The burial poles adorned by blossoming imagery constitute a double statement of death and redemption. This passes beyond the confines of art object, beyond markets, beyond the language of art criticism and the audience for art to make a statement in the broader public sphere”. Despite such recent reinterpretation, National Gallery Director, James Mollison primarily saw aesthetics when he claimed in his opening speech that the Memorial was “Probably one of the greatest works of art ever to have been made in this country”. 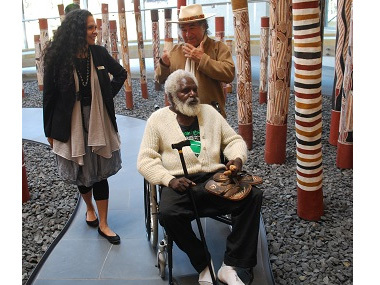 Despite the weekend's presence of the Memorial's 'conceptual producer', Djon Mundine talking up what he calls “my major artwork – my idea”, in conversation with senior Ramingining men Bobby Bununggurr and Roy Burrnyila, who had created some of the poles and played yidaki at the opening 30 years ago, there's a sense of Yolngu absence from proceedings - certainly noen of the five women who contributed poles. Having experienced the passions of an artist like John Mawurndjul in Kuninjku speeches, simultaneously translated a couple of times recently, I can't imagine anything that would have been more inspiring.Incidentally, Mawurndjul contributed a dupun to the Memorial. Instead, the Power Institute – once headed by Terry Smith – contributes the expertise of new Director Mark Ledbury in 18th Century European art. And keynote speeches are by Brisbane artist Fiona Foley – who at least has Memorial experience through the 'Edge of the Trees' installation outside the Museum of Sydney – and Canadian Metis academic David Garneau, who has a theory of memorials as social medicine. Mundine is hopeful that at least one publication will emerge from the event; “Something that will give a clearer and broader picture of the Memorial than visitors to the NGA today naturally get”. And fortunately, Djon Mundine retains his reputation in Ramingining: “Djon's a dreamer – it was lucky we had him at the time”, extolled Bobby Bununggurr as Mundine and NGA Director, Nick Mitzevich visited Arnhemland this week to prepare for the weekend.